Krysti Joy Fasching, owner and operator of Wake N Bake Coffee & Tan, is a cool hip chick who I met through a long time friend from high school. She has a fun personality and is very friendly and outgoing…someone you feel comfortable with from the moment you meet her. My friend Audra and I had decided to get spray tans for an upcoming function and Audra, owner and operator of Iyashi Wellness Center, had been going to see Krysti for some time. I am always up for meeting new people and so I was all for it. Little did I know that my visit would result in another great post for my blog. I am always in awe of the creativity that flows from people. Upon entering the salon, which is in a strip mall, you get a welcoming feeling. The door stands open on a warm day, you can smell coffee, there are plenty of comfy couches and chairs to sit on and Krysti and her employees and friends gather and talk and drink coffee. The colors are vibrant and the whole salon has a cool vibe. Naturally being me, my eye immediately goes around the room…taking in all the decor and colors. The first thing I notice is the great garbage can, the kind that Oscar from Sesame Street lived in, with a wooden top that was being used as a table. I got that rush of excitement I usually get from design and knew that there had to be more of these clever ideas throughout the salon. It usually is the way it goes. Design ideas do not generally end with one good idea…usually as you go you expound upon the first idea and it just keeps going. Naturally it would be great if you already had a few of these cans around but even if not, they are not that expensive. You can leave it natural or you could paint it, stencil on it or even decoupage something on it. The wooden top again could be from a piece of wood you have sitting around or you could cut a top off of an old end table that you thought no longer had any use. In the picture below, Krysti uses old spools that once held Gudebrod Bros. silk threads to double as paper towel holders. 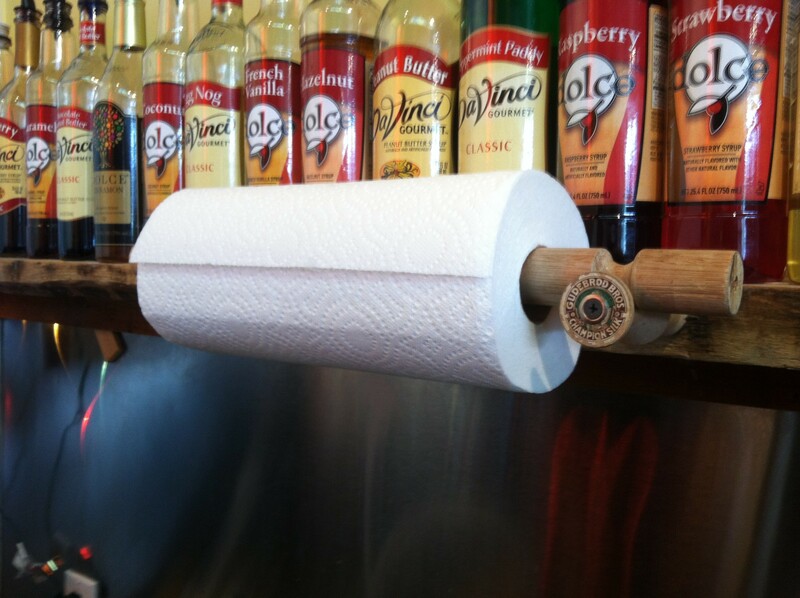 She put a dowel through the paper towel roll and set it on 2 spools which had been screwed into the wall and you have an instant paper towel holder with a whole lot of originality and uniqueness. 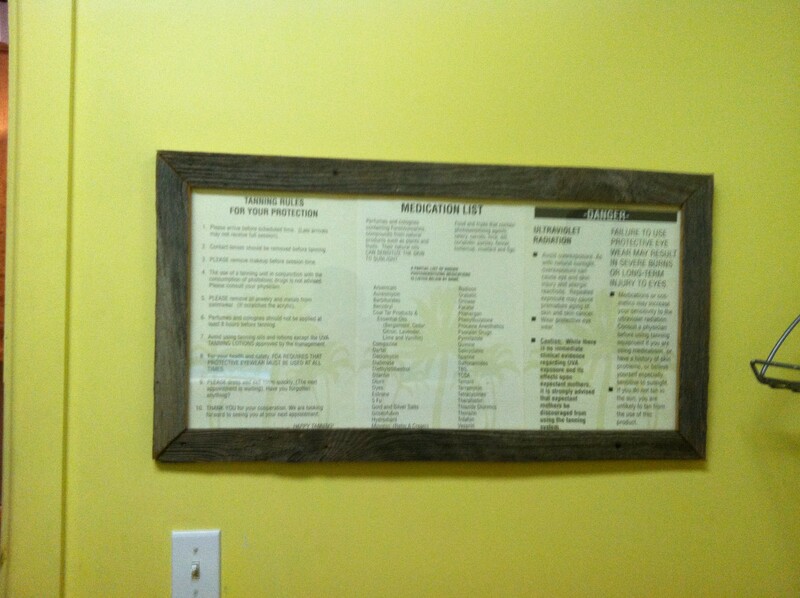 As we work our way down the pictures in this post next you will see the tanning salon rules framed in old wood to give you the feel of driftwood. 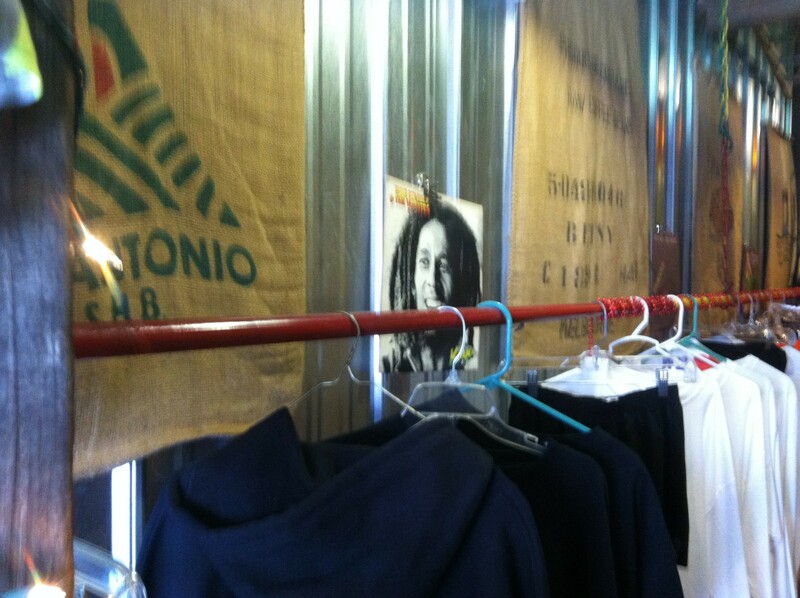 Let’s face it…everyone has old wood sitting around somewhere and instead of buying another dollar store frame with no character, why not reuse what you already have. 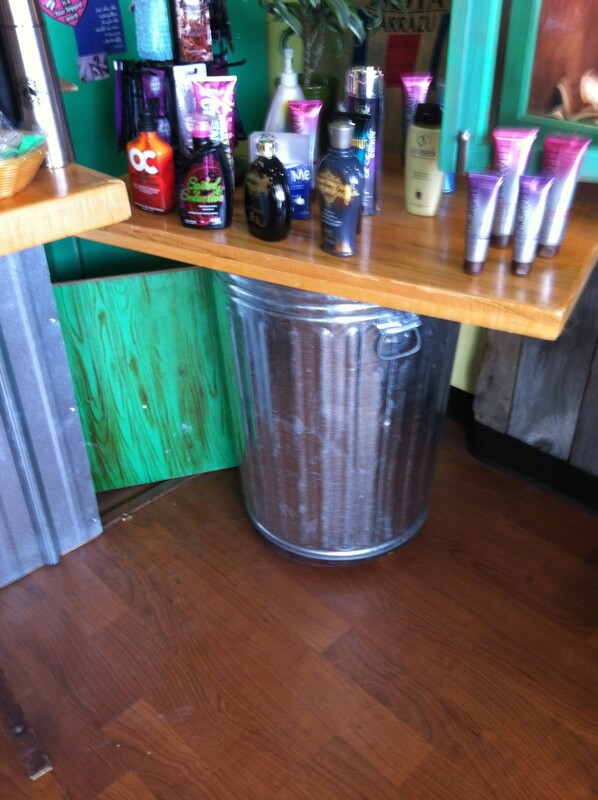 Finally, the last picture shows how Krysti cut in half the lid that goes to the trash can and screwed it into a piece of wood which creates a shelf to be reckoned with! You do not have to be a creative spirit to learn how to do things like this. The world wide web is an endless source of ideas just like the ones Krysti has utilized to make her salon truly a unique space of her own. It is something you just do not see and something you are guaranteed never to forget. I applaud Krysti for her desire to create a unique space while all along saving the planet from more items being thrown in our landfills. Do you want a space like this? I urge you to find items that you do not want to throw away and simply google how to re-purpose that item. If you can not find anything or need help…please contact me using the contact form on this blog. I would like to thank Krysti for her hospitality and for taking the time to let me take pics of her creations and for explaining how she put these items together. Go see her…even if to see her salon and say hi…grab a coffee and maybe try one of her spray tans or try the stand up booth which I love. It is all about creating a feeling that makes people want to come back and I think Krysti has accomplished this beautifully. Her salon is located in the strip mall by the Giant on Emmaus Ave. She can be reached on her Facebook business page or call (610) 797-2050.